Roulette game gamblers have a lot of betting options and correspondingly the same amount of different payments for winnings. Online casinos gambling sites offer various payout sums, but they are counted according to the same principle. Straight Up Wager (pays 35:1) is placed on one number. If the player bets $10 on 15 number and wins, he/she receives $350 to the initial wager. Split Wager (pays 17:1) is placed on two neighbor numbers. If the player bets $10 on 11 and 12, he/she receives $170 added to the initial bet. Street Wager (pays 11:1) is a stake on 3 numbers in a line, for example, 34-35-36 and you win $110 if the initial wager was $10. Corner Wager (pays 8:1) covers 4 neighbor numbers (e.g., 1, 2, 4, 5). If the ball stops on one of these numbers, you receive $80 for the $10 initial wager. 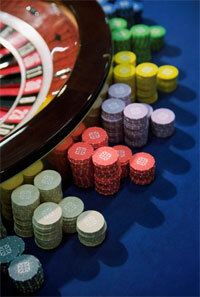 numbers Wager (pays 6:1) is allowed American roulette players only and is very convenient for the houses. The bet covers the horizontal line with the 0, 00, 1, 2, 3 numbers and the gambler, who won receive $60 to the $10 initial wager. or 00 Wager. It is the split wager variation. Basket Wager puts on 0, 00, 2 numbers and is the street wager variation. Red/Black Wagers (pays 1:1). The player needs to place the bet on one of the colors zone and wait for the results. He/she wins the amount of the initial wager. Even/Odd Wagers (pays 1:1). The conditions are the same, as in previous example, but the player makes stakes on odd or even zone. Small/Big Wagers (pays 1:1).Small bets include 1-18 numbers, and big ones - 18-36 numbers. Dozens Wager (pays 2:1) includes bets on one of the zones - 1st 12, 2nd 12 and 3rd 12. If the player puts $10 wager, he/she wins $20. Columns Wager (pays 2:1) consist of three sets containing 12 numbers each and the initial wager is doubled.